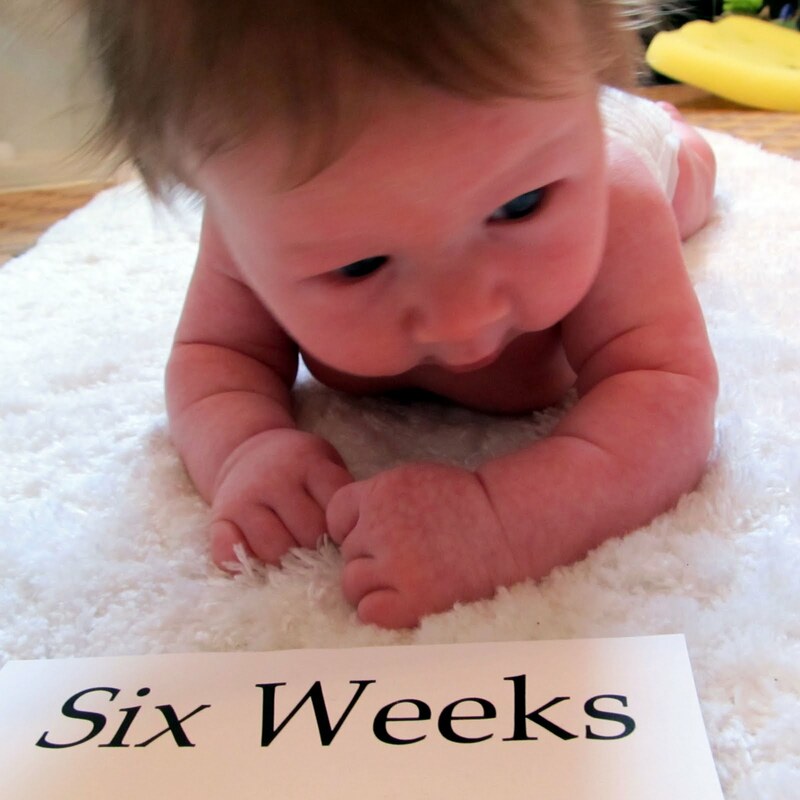 Week six brought more smiling and even a little cooing! 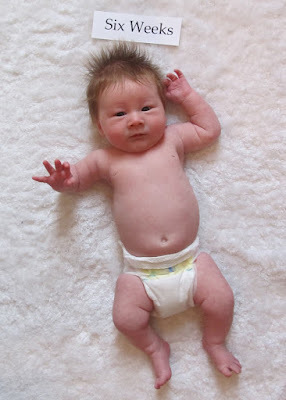 And according to most of the baby sites I've visited, it also marked the end of Miles' newborn phase. He is now officially an infant. Although I have no other babies to compare him to (and haven't had him officially weighed), my guess is that he's quite a bit bigger than your average infant. I now buy size 2 diapers and - as I reported last week - he wears 3-6 month clothes. I think I need to invest in a two-shoulder baby carrier that works well for infants. Although I love the fleece kangaroo korner pouch that I'm borrowing from my sister, it's starting to hurt my back! But I am becoming stronger from carrying this guy around. He's getting stronger, too - holding his head up higher and higher every day! Hmmm... Let's see.... What else happened during Miles' sixth week? The first two days were actually kind of nice. Cozy, even. We made Christmas cookies, watched movies and lazed around the house. By Monday, though, I was suffering from some serious cabin fever. School was cancelled, our street was stilled unplowed, and I was stuck at home all day with a stir crazy 5-year-old and a fussy baby. When school was cancelled again on Tuesday, I contemplated promising the city that I would personally pick up any kids still stranded due to unplowed streets...on snow shoes, if necessary. But then I ventured out to Target with the kids and realized that the roads really were still too bad to have school buses driving around. Thankfully, school resumed on Wednesday, the temps rose a bit and our road conditions improved (ever so slightly). Now we just have to hope for no more snow until the end of March. It could happen, right?